On Sunday, April 7, 1 p.m., the 2019 Summerfair poster will be unveiled with a signing by the artist, June Pfaff Daley at Joseph-Beth Booksellers in Rookwood Commons. The 2019 Summerfair Cincinnati features a design by June Pfaff Daley from Cincinnati. June is a freelance graphic designer, mixed media artist, crafter extraordinaire, and art instructor to both children and adults. Her paintings have been displayed in art galleries and her original can sculptures were selected for Red Bull’s national art competition, Art of Can, in both Chicago and Houston. She's been featured on the HGTV show “That’s Clever” and published in both books and magazines including Cloth Paper Scissors. June designs original stencils and project tutorials for StencilGirl Products. She’s inspired by classic children’s stories, nursery rhymes, fictional characters, travel, yard sales, thrift stores and baking. Her sense of humor is often visible in her whimsical style of art. 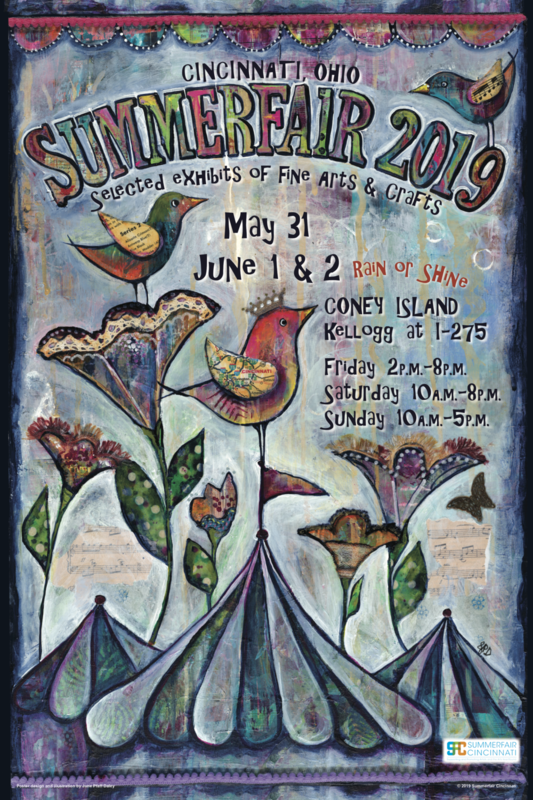 Summerfair Cincinnati, one of the oldest continuous art fairs in the country, will be back at historic Coney Island for its 52nd year from May 31-June 2, 2019. The juried art exhibits are showcased in 12 categories, including photography, painting, drawing/printmaking, wood, medal, sculpture, glass, ceramics, fibers, leather, jewelry and 2D/3D mixed media. Proceeds from Summerfair Cincinnati provide award, scholarship and exhibit opportunities to a variety of emerging (high school and college), individual (working professional) artists and local/regional small and mid-sized arts organizations throughout the year. Summerfair is listed in the top 50 America’s Best Art Fairs and one of the top five Best Midwest Art Fairs by Art Fair Calendar.com. Tickets to Summerfair are $10 (cash only at the gate), with children 12 and under admitted free. Advance one-day or multi-day tickets are available online at summerfair.org. Summerfair Cincinnati is a non-profit 501(c)3 arts organization that has been supporting and promoting artists and the arts in Greater Cincinnati year-round for 52 years. Summerfair Cincinnati, which consistently ranks in the Top 25 among U.S. Fine Art and Design Shows, provides support for individual artists and small arts organizations through scholarships, awards and exhibitions.